Combine flour, baking powder, & baking soda in a bowl. In a measuring cup combine buttermilk, eggs, and oil. Gently fold buttermilk mixture into flour mixture. Keep it lumpy. 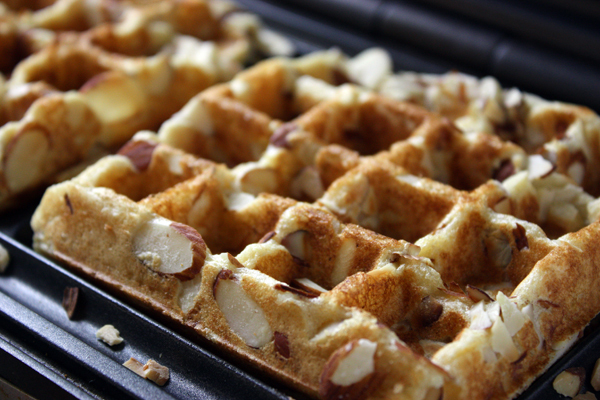 Place batter on preheated grids & quickly top each waffle with 1/4 cup of almonds. Bake for up to 5 minutes, depending on your waffle iron. No whole wheat pastry flour? No buttermilk? See Substitutions in my blog. 16 Comments on "Whole Wheat Waffles"
Love all your channels! Love your carisma and your sense of humor! Is there any way I can reduce this recipe for one person? My husband does´t eat sweets (good for him! LOL), but I love waffles! I have made half the recipe by simply reducing each ingredient by one half and it turned out well. Making any less than half would be tricky. Have a request for you Jenny. Would like to know how to make and bake Cronuts – appreciate your help. I’m sorry I do not have a recipe for cronuts. LOVE yur recipes!!!!! What is whole wheat pastry flour? What must I add to ordinary whole wheat flour to make it pastry flour? Do you think I could use this recipe and make pancakes instead of Waffles? Thanks for your response. I used the waffle batter for making pancakes and they came out awesome. I also made 2 days ago the blueberry buttermilk pancakes without the blueberries and they were awesome too. My husband just loved them. Thanks for such awesome healthy recipes. These waffles are truly light and airy. They taste like regular waffles even though they are made with whole wheat pastry flour(milled it fresh in my grain mill). Love it Jenny. Thanks so much for all your wonderful recipes. Jenny, I stumbled on your blog recently and love it. Who knew good ole Jenny Jones would have a food blog? Not me. I’ve been pleasantly surprised and impressed. Thanks for sharing your ideas! I made these waffles today for my fam and we LOVED them!!! The recipe was so simple and quick. I love the toasted nuts. It opened such a world of ideas to me. I added some almond extract to enhance the almondy-ness of the waffles and a few scoops of whey protein powder just to up the protein ante. (Couldn’t even taste it in there.) I think I can throw all my old waffle recipes away now. Can’t wait to see what else you have on this site that will revolutionize my eating! Hello Jenny! Will I get the same results using almond milk? You won’t get a good result with almond milk. The acid in the buttermilk is what makes these waffles light and airy.